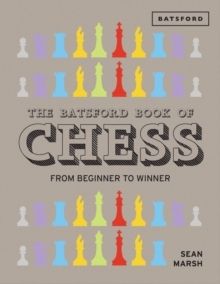 The Batsford Book of Chess is a landmark, full-colour chess instruction book, authoritatively written and beautifully designed. Arranged in the form of a course, it will take you all the way from tentative beginner to formidable chess player. 'Quick Start' reference pages help you retain the information you've learned, and puzzle sections let you test yourself as you go. To illustrate more advanced strategy and tactics, the author uses world-class 'chess heroes' such as Bobby Fischer and Mikhail Tal to bring the concepts to life. Essential topics include:* Pieces and Moves: the very basics, covering the chessboard, notation, the names of the pieces and how they move, plus an overview of chess etiquette* What Chess is All About: an exploration of chess culture and history* Winning, Drawing and Losing: Covers the various ways of winning at chess, and how games are drawn* Six Openings for Life: Coverage of six of the best chess openings, each illustrated by a different 'chess hero'* Tactical Weapons: An examination of forks, pins, skewers and other tactical devices, followed by illustrative games from Tactical Hero Mikhail Tal* Positional Play: Looks at good and bad positions, plus the art of planning, seen through the games of Positional Hero Tigran Petrosian* Human Factors: Typical mistakes and blunders you'll need to steer clear ofEasy to follow, yet more thorough and more challenging than other chess instruction books on the market, this book is an essential companion for all budding chess champions.